The Boulevard Ring (Bulvarnoye Koltso) - to be precise, an arc with both ends resting on Moskva river - goes along the historical border of Moscow, the former city wall. The wall became obsolete by the end of XVIII century and was destroyed; the boulevards were laid in its place. Names of many squares between boulevards remind of the former city gates - they are called Vorota (Gates). A tramline, once going along the complete Ring, was pitilessly cut with years. 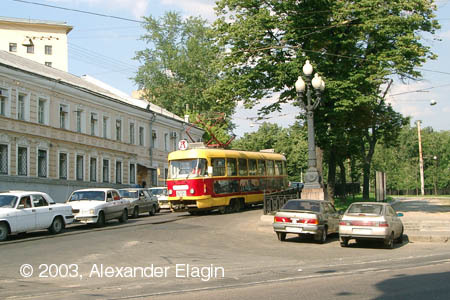 Currently tramcars run in just three of ten boulevards. And it is a miracle that the line has survived: there were plans to completely remove trams from the centre of Moscow by 1960. However, the trams and boulevards still are indivisible in our days. 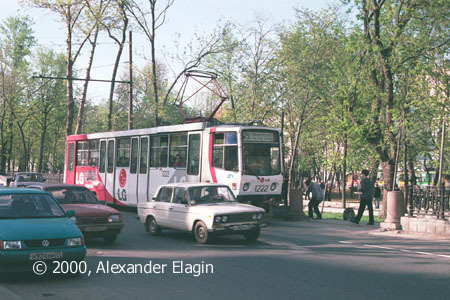 The last closure on the Boulevard line took place in 1971, when a line in Sretenskiy Boulevard and Rozhdestvenskiy Boulevard to Trubnaya Square was closed due to construction works in Turgenevskaya Square. 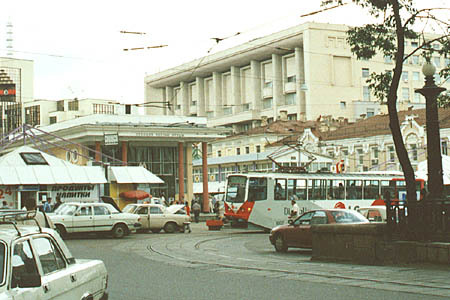 This link has never been replaced with another public transit because of a very steep slope of Rozhdestvenskiy Boulevard (9,2%). 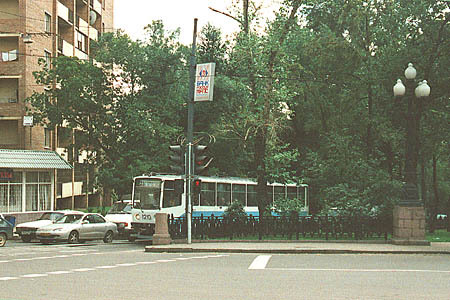 Since 1971 the tramline ends at Metro station Kirovskaya (now Chistyye Prudy). It is difficult now to appreciate the nice pavilion of Metro because of high boxes of modern buildings and ugly booths around it. This image from an old guidebook shows how this place looked in 1930s. 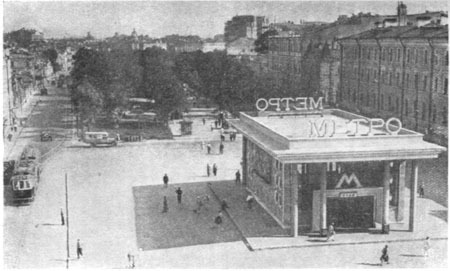 The Metro pavilion was projected to be a central point of the square, and this photo confirms its bare beauty. Note the tramline in the left - it exists no longer, today the tracks (as you have seen in the previous photo) terminate at the end of a boulevard. Chistoprudniy Boulevard. The name tells that there is a pond in this boulevard. In 1703 the pond was cleared, and it was named Chistyy Prud - the Clear Pond. Here you can lease a boat and enjoy nice weather in summer. Pokrovskiy Boulevard is a surprisingly nice and cosy place, green and rather silent. Pokrovskiy Boulevard again. 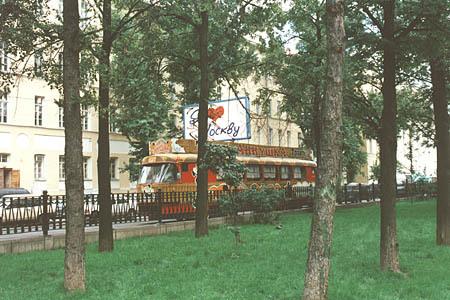 This tramcar-café is making for Chistoprudniy Boulevard. 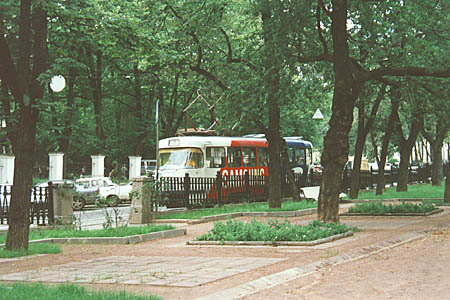 The last boulevard in the chain is named Yauzskiy Boulevard. It slopes down from this crossing with Vorontsovo Pole Street to Yauzskie Vorota Square. Although Vorontsovo Pole has no tram line since 1963, its wooden sleepers still lay under the asphalt pavement; it was possible to see their remains during the utilities relocation in 2004. A very steep slope of Yauzskiy Boulevard makes up the eastern end of the boulevard 'arc'. Tracks here are laid on different levels on both sides of the central walkway.